(where my mother grew up on a farm). blue hills and the ubiquitous rolling green pastures. After some work in the studio , this is the current version of the larger painting. 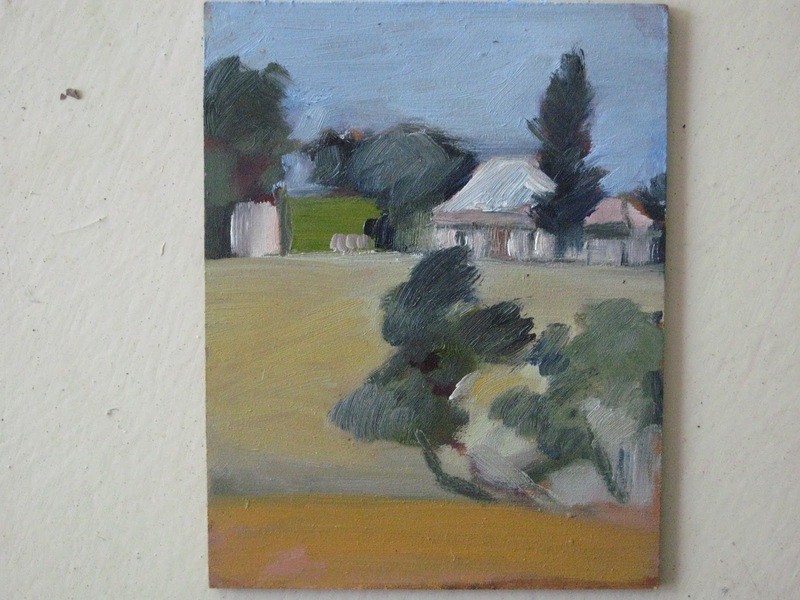 The first attempt to paint the scene I had in mind (from previous research) at Avondale, was on a hot windy day in early January. I drove out there (half an hour from home, south of Bulli) on my own, and carefully selected the spot where I had the best view of the farmhouses in silhouette across the crest of a small rise. I have always loved silhouettes and had been noticing this particular view for some time. It took a few "drive-bys" to work out where I could park without being wiped out by a passing coal truck or being in anyone's path. As soon as I backed the car in to a deserted lane way and angled back and forth for the best view, Farmer Brown arrived on the scene to enquire why I was parked there, and to tell me he had two trucks on their way to access that particular lane way at that particular time...DOH! 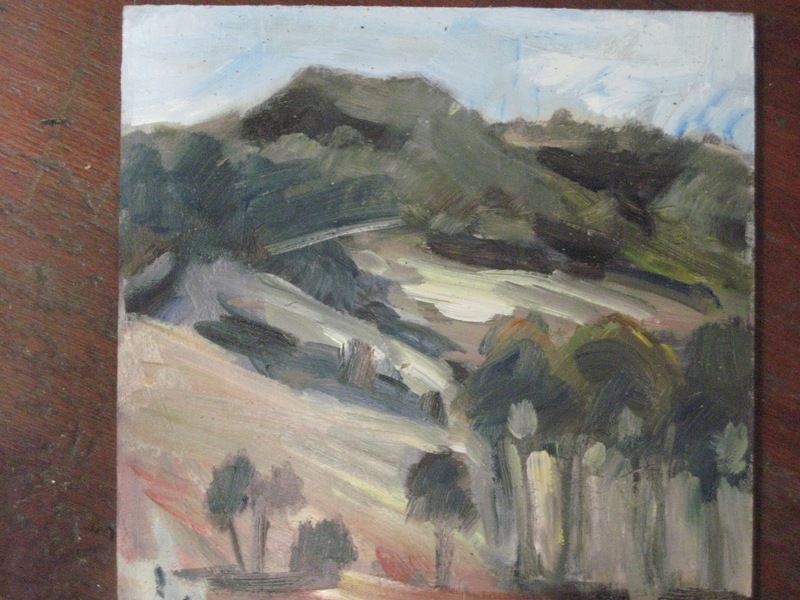 I drove up the road a short distance and found another suitably deserted spot, where to my great delight, the warm-up painting, (Oil sketch no 2, Escarpment, see above) just rolled off the brush. Hey, Kate's on fire today! With no one in sight, along came a car and stopped beside my car. A lone man (!!!!) in the car asked me where he could get a decent lunch around here... in the midst of rolling farm country, miles from civilisation...a little creepy. Fortunately he must have decided I looked incredibly strong, armed to the teeth and not carrying valuables... he drove off. Nerves shot, eat lunch, watch for lane way to be vacated by trucks, have a cup of tea. 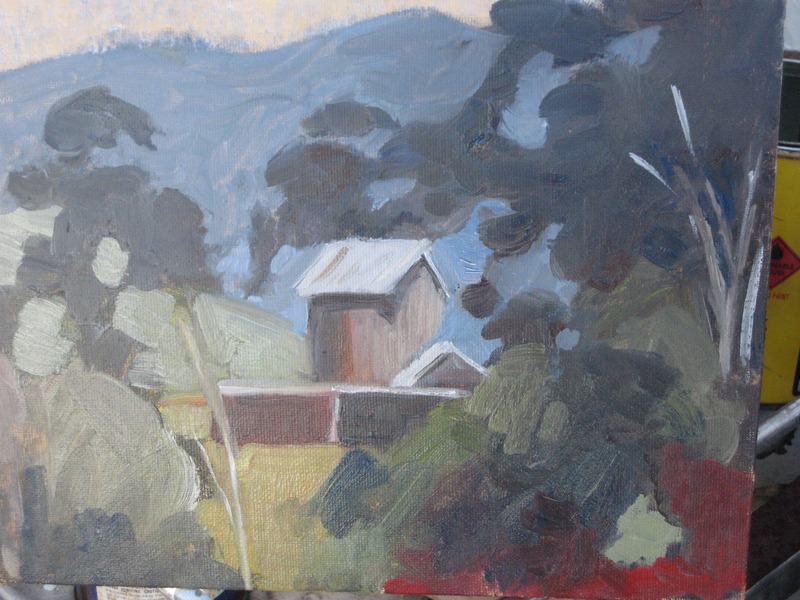 When I eventually resumed the chosen location, I got to work on a couple of oil sketches as warm-up, to assess the problems of the scene, the surprises lying in wait for the unsuspecting plein air landscape artiste. So you see the results above, oil sketch no.1 and no.3. Then came the larger work, with the various farm buildings scattered invitingly across the crest of the hill. As I worked the farm people were moving horses and yelling at each other, interacting within the set of shapes and colours which were presenting such a challenge for me. It was like a performance on a stage, which I was absorbing with a brush and paint. What a totally unique way of observing a view of the world. I wonder if the people occupying my view ever have the desire to see the finished painting? If someone were painting my house I would hang about to see the finished work. There have been a few occasions when local residents have come to look at my painting of their patch, and have loved what they saw, so I gave them the painting. A pumpkin changed hands on one occasion. 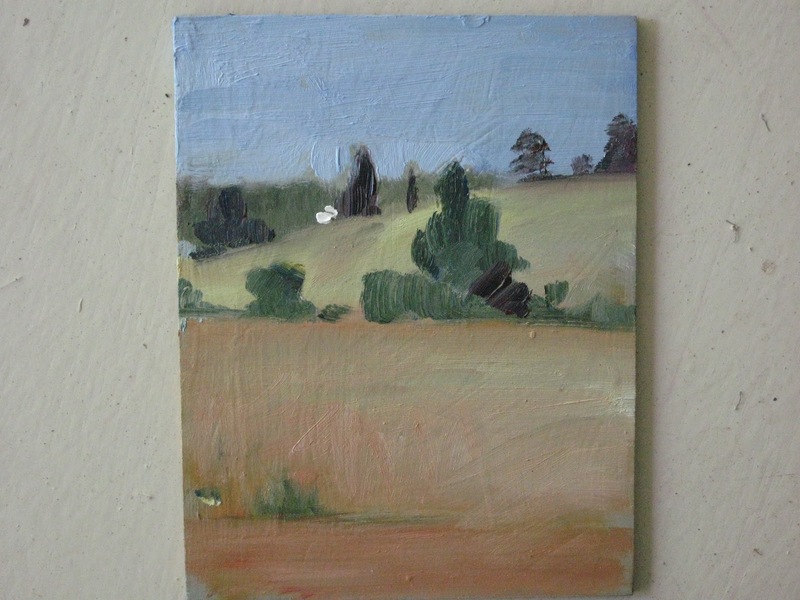 Once I had enough on the board, I drove about the various roads in the area exploring for future scenes to paint. One particular view really appealed so I was determined to go back to Avondale. 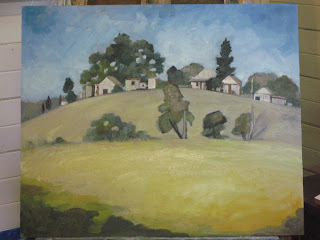 When working on the larger painting back at the studio, I had problems with the foreground. This area is so large and was tending to fall off the board, so I created a shadow falling across the foreground to enclose the middle ground. When I look at the photo of this painting (which gives a whole new perspective to it), I think the shadow is too dominant so I may do a bit more work on this one. 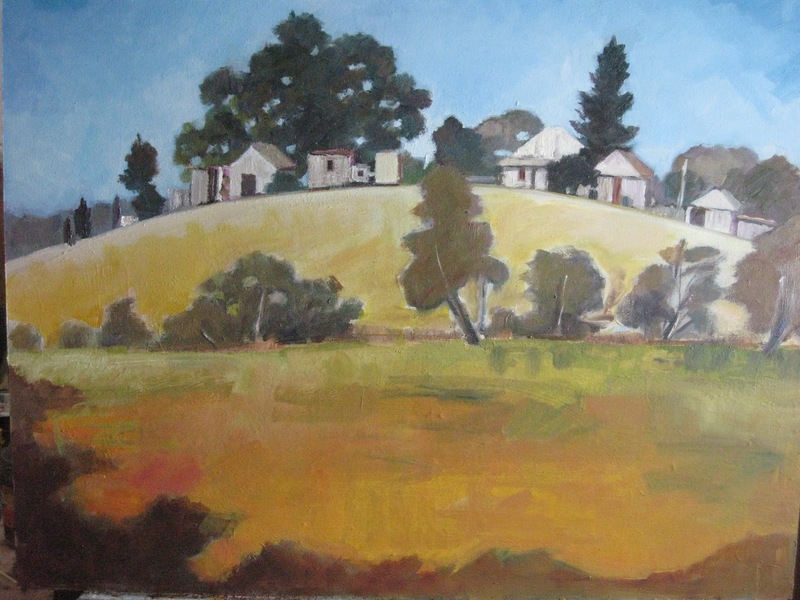 I like the citrus green and orange in the foreground, though in reality the scene was bleached ochre colours of late summer. A return trip to Avondale happened this week. 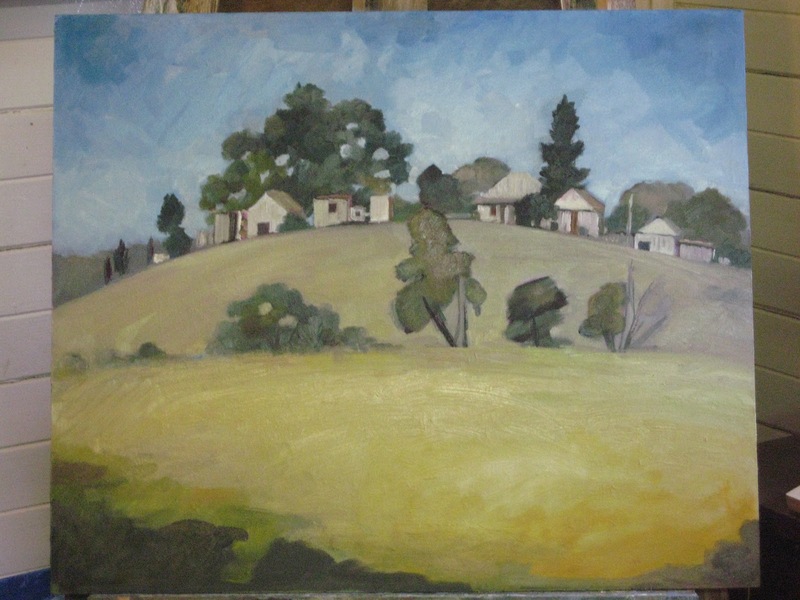 After coffee in Robertson, on the escarpment south of Wollongong, Peter and I, with our chicken sandwiches for lunch, drove back out to paint the scene previously spotted. This was of a group of farm buildings with an old silo rising through the trees. As this was quite an isolated spot, it was a good idea to have my guardian angel husband there with his book to read, to watch over me. The light rain falling as I painted presented too many problems.A large painting which was well under way succumbed to a heavier shower of rain and ran off the board. Actually it now looks like a Turner painting...maybe there is hope for that one. Sheltered under a flimsy umbrella (there is talk of a larger umbrella and stand to be used next time) I managed two smaller paintings. Surrounded by scenes which were too magnificent to be believed, it was a discipline to decide to just do the one scene a few times. I am glad I did, as the result (see below) is thrilling. A plein air artist never knows what a painting will look like. The artist is channeling the scene and it is as if a mysterious force creates the painting. That is the essence of the thrill of painting en plein air. 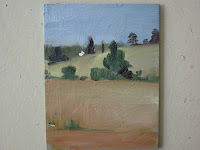 This little painting, created whilst balancing an umbrella and eating a sandwich, fills me with joy. To me I have reached some level of subliminal accomplishment, up there with Matisse, Cezanne, Loyd Rees, Clarice Beckett, Fred Williams...noone else has to believe that, but I do feel good about this painting. 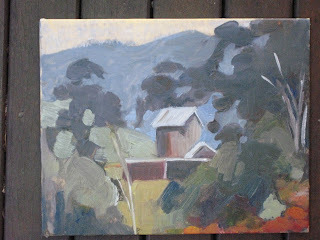 (her blog: www.thevintagefolkpainter.blogspot.com )..I went up to see her work on display at Robertson Cheese Factory. She has had such a burst of creativity, and has a wonderful selection of jewellery, soaps, and beautiful paintings on display. If you have time and need to take a visitor for a scenic drive, head to Robertson. Nice work Kate, which ones did you do after you left me?